You are invited to join the upcoming August Seasonal Dinner Event hosted at a beautiful Victorian San Francisco apartment. It’s a completely different type of social event. The menu is unique and seasonal, ingredient inspired, modern take on French cuisine, composed by Chef Mashav Shelef, cooked fresh and made from scratch. During the event you can get to know Le Couloir, taste the dishes, inspired each time by the season and mood, while engaging in a unique dinner party. The event will take place for TWO NIGHTS ONLY, communal seating, bring your own wine. 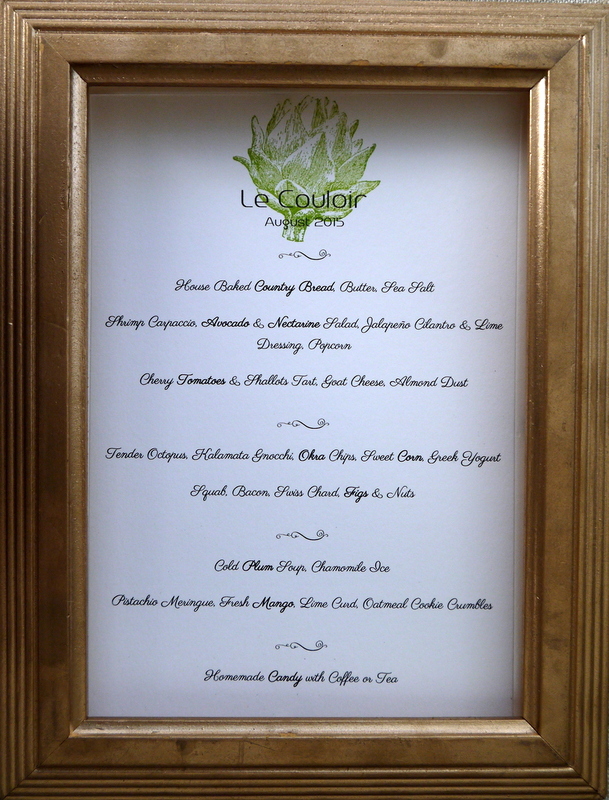 Le Couloir (meaning “The Hallway” in French) is a new Personal Chef Services in San Francisco and the Bay Area. Among our services we offer: Tailored Events, Cooking Workshops, Weekly Home Cooking for busy individuals and more to come. 1. Consider about 3.5 hours long event – 6:30pm-10:00pm. 2. Food allergies? Make sure you describe these well in the registration process of each participant to help make the best experience possible. 4. If you are Vegetarian or Pescaterian please CONTACT ME before getting your ticket, it’s possible we can accommodate you. 5. If you keep a Kosher, Halal, Gluten Free or Vegan diet – we will NOT be able to accommodate you at this time. 6. The menu published in advance might change according to season and the availability in the market. 7. Refund policy: You may cancel your seats up to one week before the dinner, you will be charged a cancellation fee of 25%. The seats will not be cancelled after that date but they can be transferable without any fees to someone else by changing the name on the digital ticket sent by e-mail. Inspired by International and Asian cuisine and her bringing up in Tel Aviv, Mashav Shelef leads the team of Le Couloir, tailoring private events, creating new and inspiring menus and making sure every event is one to remember. A graduate from Ferrandi – Paris and experienced in several Michelin starred restaurants. In 2013 created a Pop-up Secret Kitchen in Tel Aviv and now starting her way as a Personal Chef in San Francisco. She brings dedication, creativity and her undeniable passion for food together with a fresh approach to cooking derived from her scientific background. What’s the concept of Le Couloir events? Le Couloir provides Personal Chef services. The seasonal events are giving you the opportunity to get to know Le Couloir, taste the dishes, inspired each time by the season and mood, while engaging in a unique dinner party with unfamiliar people. The dinner combines the excitement of new flavors and a completely different type of social event. Only 14 guests each evening, with one common-ground which is the love of good food. The menu is unique for every event, composed by Chef Mashav Shelef, cooked and served by a small and friendly crew. What’s the style of cooking? Seasonal, creative cooking, influenced and inspired from all around the world, brought together by the French cuisine techniques. Thoughtful combinations of elements, specialty ingredients and using techniques from both the modern and classic international cuisine. Supporters of Le Couloir who might be interested in Personal Chef Services. Be the first to get an updates about events, news and promotions! I don’t want to pay online with PayPal! What can I do? Paying with PayPal is the easiest and most secure way to do the transaction, you can open a new account easily for free. To pay in another manner, contact me (We also except Credit Card by phone, Venmo, Square Cash…). How did guests like the experience? See the Yelp page and read some testimonials. Where can I post a review and pictures of the event? We would love for you to post pictures and reviews of the event in Le Couloir Yelp Page and Facebook page.